Understanding Issues Facing LGBT Americans is a short primer that summarizes the major areas in which unfair laws and stigma create extra burdens for LGBT Americans. The guide also includes policy recommendations to address these harmful disparities and to improve the lives of LGBT Americans. Movement Advancement Project, Center for American Progress, GLAAD, and Human Rights Campaign. December 2014. Understanding Issues Facing LGBT Americans. 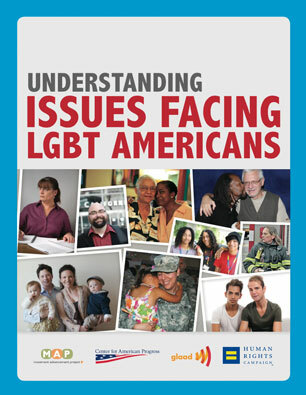 http://www.lgbtmap.org/understanding-issues-facing-lgbt-americans (date of access).